Over the past few decades, Indian capital markets have matured, and a large number of Indian market participants are now looking at capital markets as an investment avenue. Investment in capital markets has grown substantially among all types of market participants—retail, institutional, and even government institutions, where recently the Employee Provident Fund Organization has started to invest in capital markets via exchange-traded funds. Traditionally, the tendency of market participants has been to buy large-cap, blue-chip companies that form part of large-cap indices like the S&P BSE SENSEX. However, there has been a paradigm shift in investment patterns—market participants are now going beyond traditional large-cap companies and venturing into companies in the mid-cap and small-cap segments. This changing investment pattern has been reflected in equity volumes and performance of stocks in these segments. Small-cap stocks outperformed large-cap stocks by significant margins in the three-year period ending May 31, 2017. This significant outperformance by small-cap stocks has resulted in more market participants looking at the small-cap segment. The S&P BSE Indices include two indices in the small-cap space—the S&P BSE SmallCap and the S&P BSE SmallCap Select. The S&P BSE SmallCap is designed to represent the small-cap segment of India’s stock market; it seeks to track the bottom 15% of the total market cap of the S&P BSE AllCap. The S&P BSE AllCap consists of over 900 stocks, and around 750 of those are the constituents of the S&P BSE SmallCap. The S&P BSE SmallCap Select is designed to measure the performance of the 60 largest and most liquid companies in the S&P BSE SmallCap. 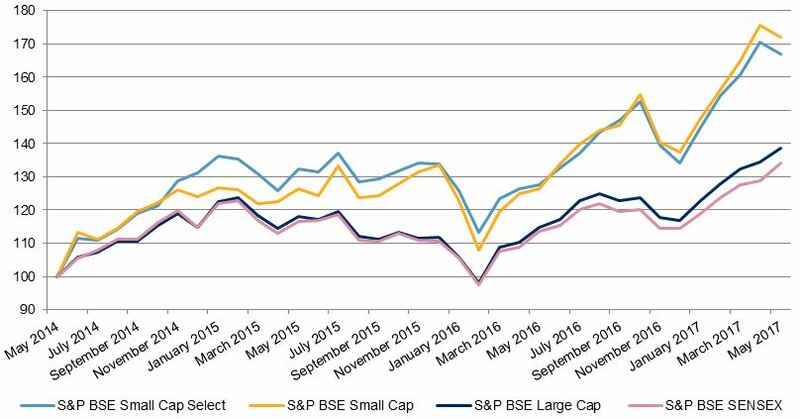 Let us now compare the returns of S&P BSE SmallCap and the S&P BSE SmallCap Select with the returns of large-cap indices like the S&P BSE LargeCap and the S&P BSE SENSEX. Source: S&P Dow Jones Indices LLC. Data from May 31, 2014, to May 31, 2017. Past performance is no guarantee of future results. Table is provided for illustrative purposes and reflects hypothetical historical performance. In Exhibit 1, we see that in the three-year period ending May 31, 2017, the absolute returns of the S&P BSE SmallCap and S&P BSE SmallCap Select were significantly higher than those of the S&P BSE LargeCap and S&P BSE SENSEX. In Exhibit 2, we see that the S&P BSE SmallCap and S&P BSE SmallCap Select consistently outperformed the S&P BSE LargeCap and S&P BSE SENSEX during the three-year period studied. The significant outperformance by the small-cap segment over the large-cap segment has resulted in an increase in interest in the small-cap segment.